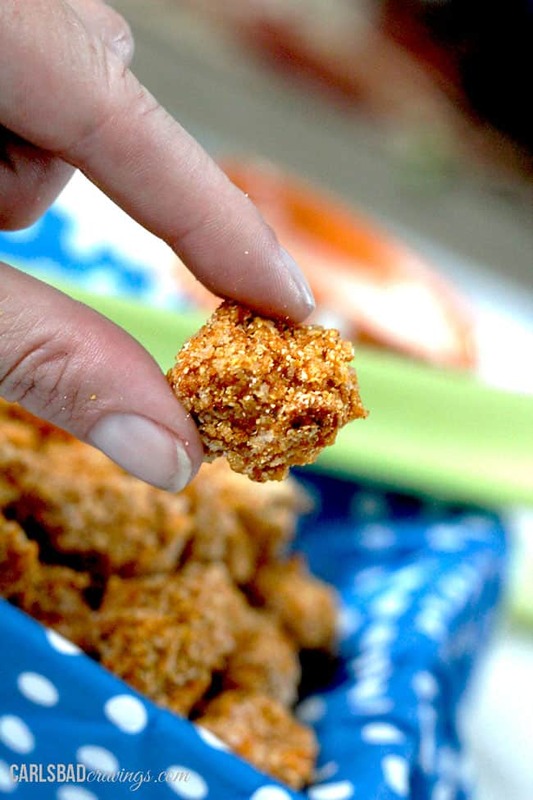 This Buffalo Popcorn Chicken Recipe is seeping with buffalo spices that is Baked not fried! This Buffalo Popcorn Chicken is dunked in buffalo sauce then baked with spiced panko and cornmeal to create juicy, crispy, purely addicting popcorn chicken that is better than any chicken nuggets! 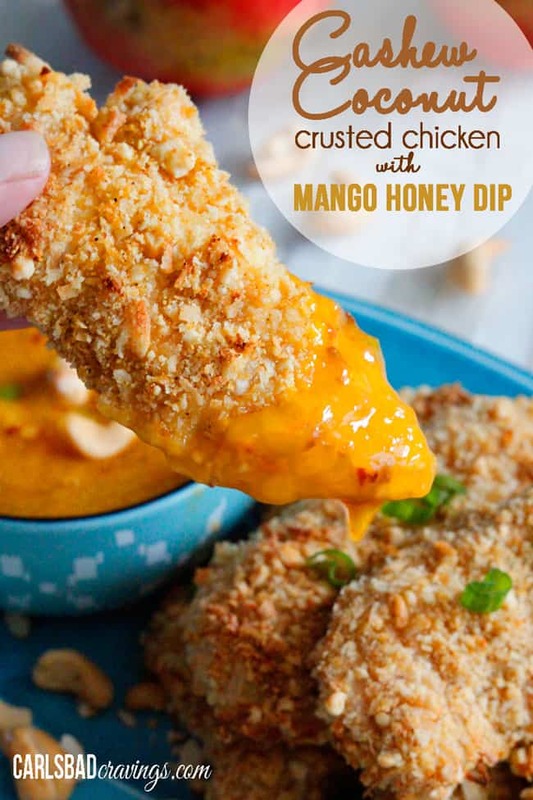 And the creamy Honey Buffalo Dip is heavenly when combined with this Buffalo Popcorn Chicken Recipe! Patrick’s famous last words before he started stuffing his face with crispy Buffalo Popcorn Chicken. And before I started stuffing my face with crispy Buffalo Popcorn Chicken. Dunk the buffalo bites in the Creamy Buffalo Honey Dip and you’re a goner. So creamy and luscious, slightly sweet and as spicy or not spicy as you like. I am in love with this dip. I am so in love with this dip and this chicken together. You can’t just have one piece. You can’t just have 5 pieces. You might as well pull up a chair because you are going to at least have 20 pieces. I’m just sayin’. These spicy morsels are so good, I was actually nibbling and dunking the leftovers straight from the refrigerator, cold. I just couldn’t leave them alone long enough to microwave for 45 seconds. And truth be told, there would have been ZERO leftovers, but I had to redo some of my pics with better lighting. The first pics probably would have been fine, but when dubbed “your best ever” by my food critic, I thought I needed some better pics. So the full basket below is from day 1. The rest are from day 2, propping the chicken up so the baskets look full. They are not. The chicken was doing a happy dance in my stomach. 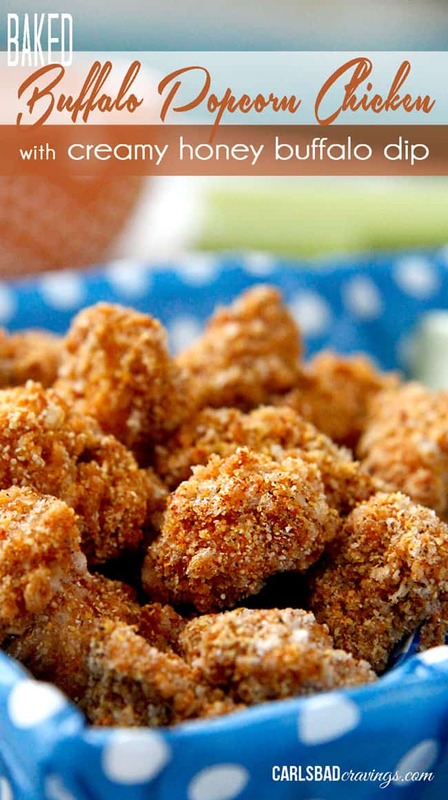 I pretty much think this Buffalo Popcorn Chicken Recipe are perfect for any occasion: the most delectable baked snack, the hero appetizer at game day or any party, or add some veggies on the side and you have yourself a meal – my kind of meal, Patrick’s kind of meal and most definitely your kids kind of meal. I originally thought of making buffalo chicken nuggets, but I am so glad I went with bite size, because popcorn chicken is even more delicious than chicken nuggets. Not only can you pop the entire bite into your mouth one at a time, but the small pieces are more tender and more easily soak up the egg/buffalo bath (no need to marinate!) and allow more surface area for crispy breading – but not just any breading – cumin, chili powder, paprika spiced breading made extra crispy with the combination of panko and cornmeal. An explosion of crispy flavor fireworks! So addicting, you won’t be able to stop popping these crispy on the outside, tender on the inside morsels into your mouth. So good, you’ll be eating the leftovers cold. 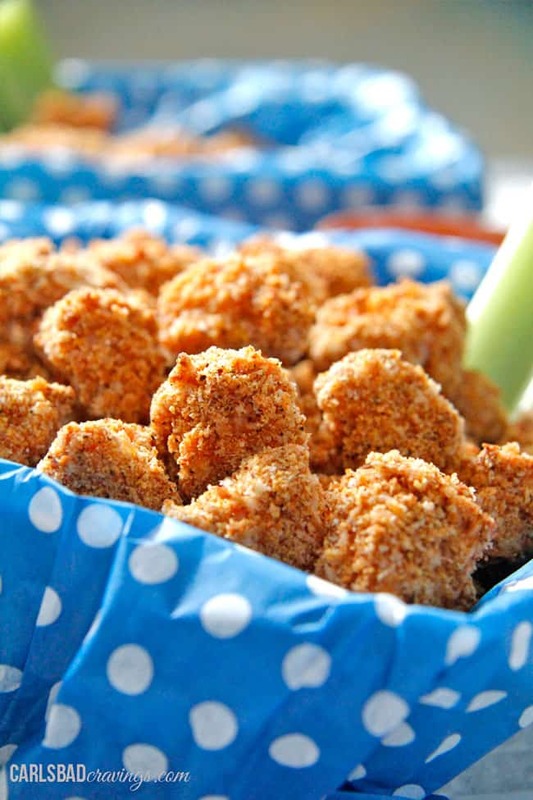 This Buffalo Popcorn Chicken Recipe is seeping with buffalo spices that is Baked not fried! This Buffalo Popcorn Chicken is dunked in buffalo sauce then baked with spiced panko and cornmeal to create juicy, crispy, purely addicting popcorn chicken that is better than any chicken nuggets! And the creamy Honey Buffalo Dip is heavenly when combined with this Buffalo Popcorn Chicken Recipe! Line a baking sheet with foil. Place a baking rack on top of the foil and lightly spray with nonstick cooking spray. Preheat oven to 425 F.
Add flour to a large freezer bag. Mix together Panko Breading ingredients in a separate large freezer bag (or separate large bowl). In a large bowl, whisk together 2 eggs and 1/4 cup hot sauce. Add chicken to flour mixture and toss until coated. 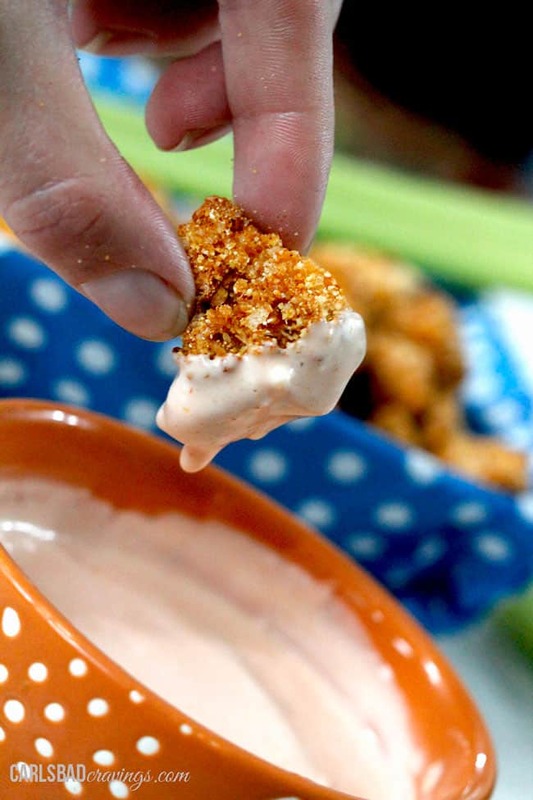 Dip chicken in egg/buffalo sauce mixture and let any excess drip off before placing in bag with Panko Breading. Toss with breading until well coated, pressing breading into chicken through the bag. Line chicken on the baking rack, and lightly spray with cooking spray. Bake for 10-15 minutes or until the chicken is cooked through and golden. Broil to desired crispiness. 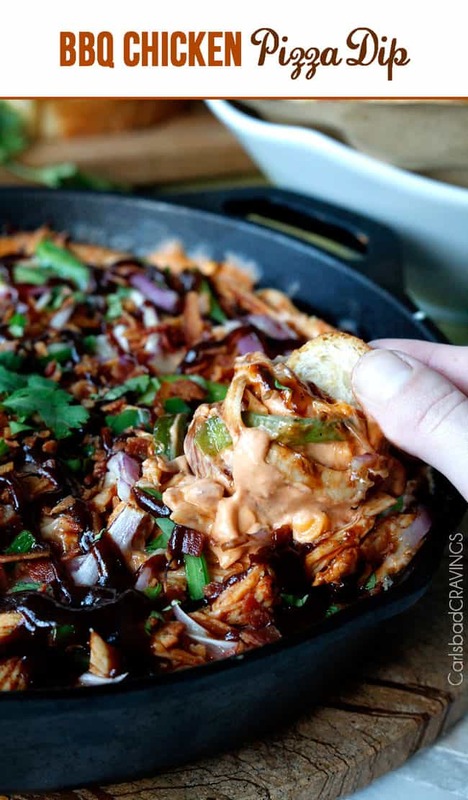 Meanwhile, make the Creamy Honey Buffalo Dip by whisking all the ingredients together except the hot sauce. After chicken is done, taste a piece to decide how spicy you want to make the dip and proceed to add hot sauce. (I use a full teaspoon and it is hot how I like it 🙂 Start popping! *See BELOW for more delicious recipes using Frank's Hot WINGS sauce. 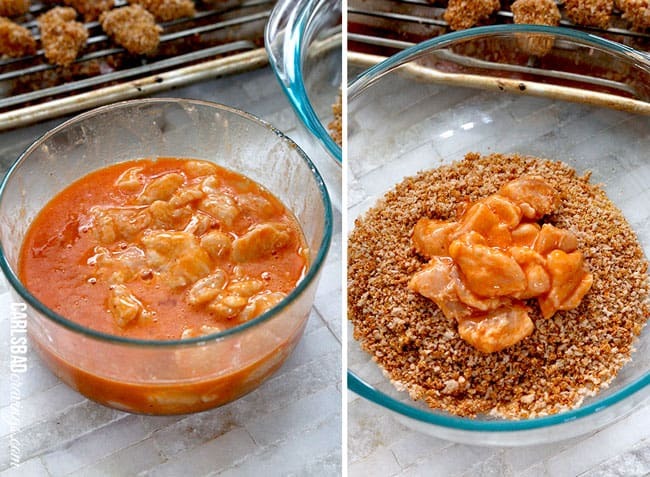 Want to try this Buffalo Popcorn Chicken Recipe? Pin it to your SPICY, CHICKEN or DINNER BOARD to SAVE for later! Oh my gosh! Those do look addicting! 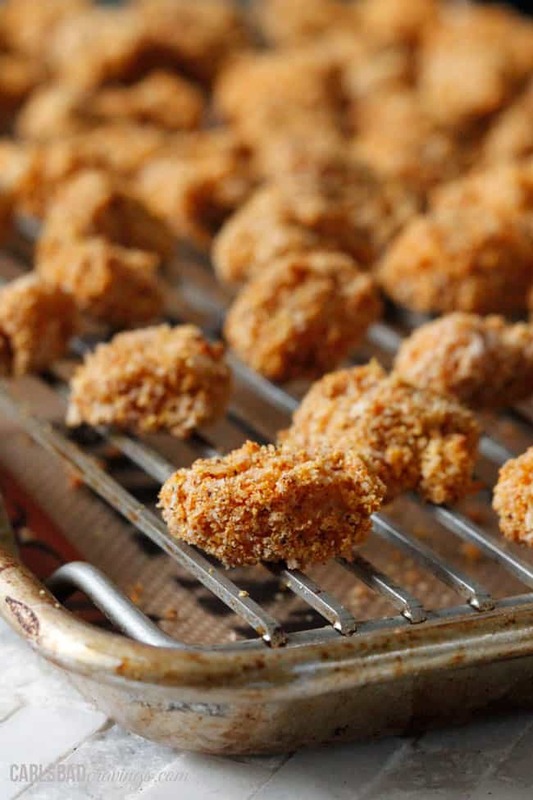 Definitely a smart idea to make them bite size to increase the surface area for more crispy breading. Yum! My kids would LOVE these!! 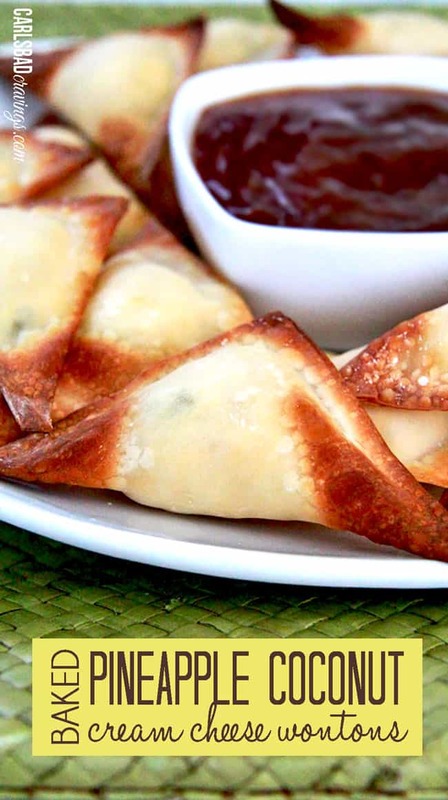 I’ve made nuggets like these before but never with a dipping sauce. Bookmarking to try soon. Everything is better with sauce! I hope you get a chance to make them soon, I think you will love them :)! I made these and the cranberry meatballs for a few guests I had coming over tonight. THEY WERE BOTH AMAZING! I absolutely love your website and I’m glad I found it. You cook exactly how I like to cook, but you have some great recipes that I hadn’t thought of! 🙂 Thank you. Awesome Kara, I am so glad you loved them both! 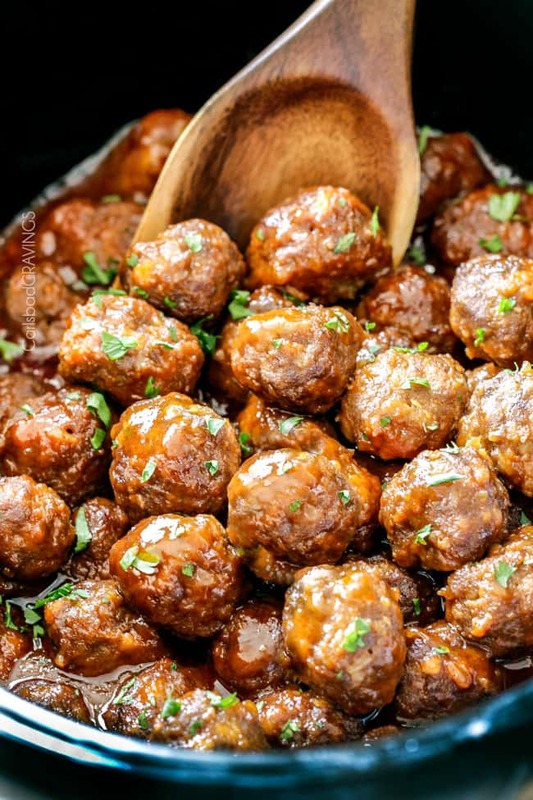 And you are the first to comment on my meatballs so that makes me extra happy to hear 🙂 I am so happy you found my site and that we share similar cooking styles, I know how exciting that can be! I hope you find and enjoy lots of recipes here! Welcome! Hi Matt! That is so cool you have your own bees – I have to say I have never met anyone who made their own honey – so cool! I am so happy you loved this recipe and you don’t have to be ashamed that you are powering through them all on your own – that is the highest compliment! and I am right there with you! I have to say, I basically never comment on food blogs-ever- but yours has been the only one I ever have. This was fantastic, flavorful and, most importantly, crispy. Definitely telling everyone I know to come back here and try it out. I’ve never had a bad experience with anything I’ve cooked from your blog. Keep up the amazing cooking inspirations! Hi Jen, you comment made my day – especially knowing you never comment! THANK YOU for taking the time to comment and thank you so much for following along! 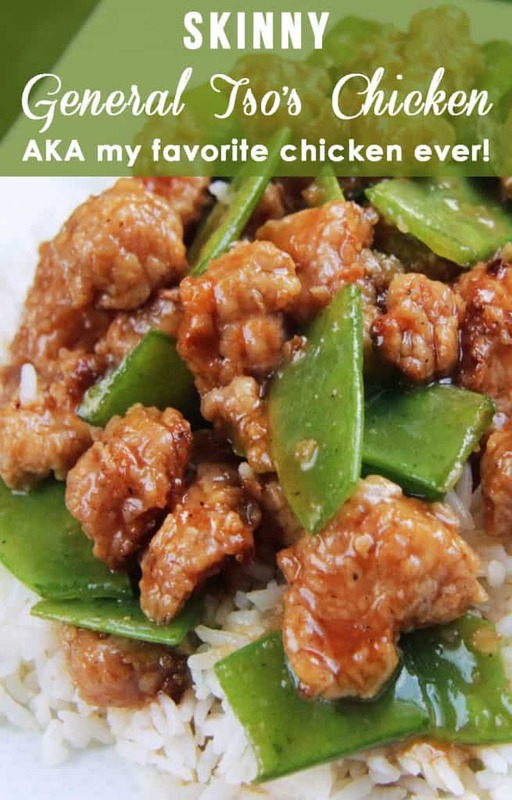 I am thrilled you loved this chicken and other recipes you have tried. I hope you continue to find more to enjoy. Best! Hi Gabby, I LOVE hearing that you have made so many of my recipes and loved them – that is awesome! Thank you thank you for taking the time to make my day! I hope you continue to have fun exploring my site!